Fields are coloured brown where cultivated, and green or blank if untilled. Stonework buildings or structures are drawn in red ink at the major settlements of North Fleet and Gravesend. Infilled or blocked areas of black or sepia ink depict structures or buildings made from impermanent materials such as wood. 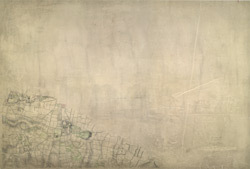 A great deal of care has been taken in the drawing of the field boundaries, with individual bushes and hedges depicted.